I was asked whether this photo could be used for the top banner of a community web site, so I’ve adjusted the tone of the right-most section of the panoramic to make the seam a bit less visible, and the end result can be seen at the Bournemouth Matters web site. This was one of my first attempts at using hugin. Another attempt didn’t work so well at all. I’d started out having already taken some photos and just hoping that they might overlap! This entry was posted on Saturday, November 15th, 2008 at 1:25 pm	and is filed under Thoughts. You can follow any responses to this entry through the RSS 2.0 feed. Responses are currently closed, but you can trackback from your own site. 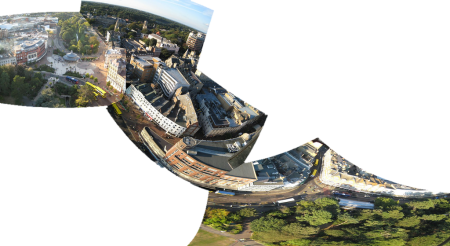 I’ve been needing to play with Hugin — looks like it might not blend exposures? — this is a time where I really wish Autostich was open source. Auto-exposure lock on the camera should help some if you weren’t using it. I don’t really know, I’m quite a novice at hugin. It has loads of options, so maybe there’s one there for that. Yes, I know about auto-exposure lock, and I thought I’d engaged it (I might be mis-remembering). I know I’ve had problems before with daylight shots whenever there is cloud near the sun, because even with auto-exposure lock enabled if a cloud wanders over in front of the sun the light will have changed anyway. Needs a bit more playing around with to get the hang of it I think. Consider using enblend as the final step which will remove some of the colour differences and hence join lines between different photos. We need some computer graphics students to implement us one.